The attack by U-47 on the Royal Oak was without doubt one of the most significant actions of the war, in that the threat posed by Prien and his colleagues finally received the complete attention of the British high command and the then First Lord of the Admiralty Winston Churchill. Churchill, who in an announcement made after the attack grudgingly described Prien's feat as "a remarkable exploit of professional skill and daring", had always been aware of the "U-boat peril"; it was this change in general attitude that was to play a significant role in turning the tide against the U-boats. It was indeed fateful that only the Royal Oak had been moored at Scapa Flow that night; had the damage to the North Atlantic fleet been more significant, it is likely that the British campaign in the North Atlantic might have been given a severe setback. What Kapitänleutnant Prien and his crew achieved at Scapa Flow is given further significance when one considers that the Royal Oak was one of only three British battleships to be sunk during the entire war, and one of only two to be sunk by the Germans - the other being the HMS Barham, sunk by the Type VIIC U-331 off the North African coast in November 1941. The biggest boost impact of the Scapa raid however was its propaganda value; the Royal Oak was an ageing vessel and its sinking, while certainly demoralising for the Royal Navy, was less strategically important that the loss of the battlecruiser Hood in May 1941, or even the aircraft carriers Courageous, Ark Royal and Eagle - all of which were sunk by the Ubootwaffe. "I was stationed on the shores of Scapa Flow from September to December 1914. I was one of a company of territorial artillerymen manning a battery of four 12-pounder guns guarding the eastern entrance to the Flow. We guarded the entrance which Prien navigated the U-47 while fully surfaced, on his way to torpedo the Royal Oak twenty-five years later. I can swear that had he tried that caper in 1914 by night or by day, he would never have made it. We were on strict watch day and night and not a moving object would have escaped our attention. We old artillerymen regret to think there must have been great negligence on the part of the three branches of our armed forces when a submarine could go undetected while cruising on the surface on an autumn night in the unpolluted clear air of those northern climes." Back in Germany, U-47's exploits became the stuff of legend. Fêted by the Nazi leadership, Prien soon became the Kriegsmarine's official poster boy. To no great surprise, the story of the sinking of the Royal Oak was distilled and rebottled for the German public in the form of a book, Mein Weg nach Scapa Flow, ostensibly written by Prien but the product of ghost-writer and marketed as a rollicking read intended to both boost morale and get young lads lining up at the recruitment offices of the Ubootwaffe. 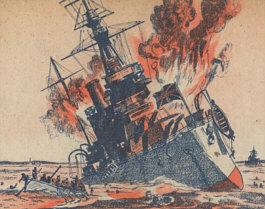 Numerous other commemorative items were also created following U-47's attack at Scapa Flow. This included daggers, medallions and items of crockery. Many of these items are today seen as collector's pieces, though given the number of unofficial pieces and lack of precise information it is difficult to tell what are and what are not genuine items. What is certain however is that Prien's mission made such an impact that it became legendary. The raid not only left an impression on those in Germany; even American bubble gum manufacturers got in on the act. A striking medallion commemorating Prien's attack on the Royal Oak at Scapa Flow. The Obverse (at left) contains an image of Kapitänleutnant Prien, while the Reverse carries two images of the sinking battleship and the inscription "Torpedoed 14.10.1939". (Thanks to Holger Dorn for both of these images. 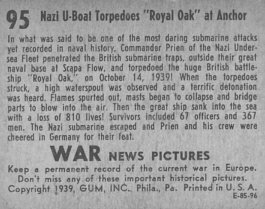 Mainly as a result of every available propaganda opportunity being enthusiastically grasped by the Nazi regime during its coverage of the raid, the story behind the sinking of the Royal Oak has been shrouded in controversy. Many of the surviving members of Royal Oak's crew had been keen to cast doubt on the story that their vessel had been sunk by an enemy submarine, and these doubts were exacerbated by their hearing what was then the official German side of the story. Some of the claims were made out to be so outlandish - from the claim that the Repulse had been hit through to the story that U-47 had been dramatically chased down by a destroyer - that many felt justified in doubting that Prien and U-47 had made its way into Scapa Flow at all, let along sunk the Royal Oak. Things were certainly not helped by the bellicose speeches that were heard in Germany immediately after the raid, and in the text of Prien's supposedly autobiographical work, Mein weg nach Scapa Flow. His [Prien's] exploit was turned into a propaganda circus, in which he was expected to play his part for the greater glory of the Third Reich. The circus culminated in the publication of a supposed autobiography which was, in fact, largely a fake and could in the long run serve only to make a braggart and liar of him. Far from being a loudmouth, Kapitänleutnant Prien was keen to keep himself out of the limelight as much as possible. He merely tolerated the propagandists who flocked around him, and largely ignored the thousands of autograph requests that came his way. With regard to Mein Weg nach Scapa Flow, ghost-written by a man who would later regret his very involvement in the project, Prien had next to no actual influence in it. He had little spare time anyway in between what were often gruelling patrols; according to his widow Ingeborg, on the few occasions her husband did get to see any of the manuscript she often saw him angrily crossing entire sections out. She was herself fairly certain that none of these changes ever made the final copy. As far as the saga of the Repulse is concerned, all of the evidence suggests that Prien was if anything rather reluctant to say much about it - to the point where one might even begin to think that words might have been put into his mouth. Indeed, when his former commander Karl Dönitz was asked in 1978 by researcher David Lees about the positive identification of the Repulse, he clearly stated the source had been "the German High Command". Even with more recent research, there are probably still some people who would beg to differ with these more recent findings. It is rather unfortunate that the heady combination of brazen propaganda - and a book that what was no doubt published as an exciting and fast-paced read for German schoolchildren - helped serve to cast doubts on what was probably one of the most audacious and daring feats of the Second World War.